I used to wonder why my hydrangea’s wouldn’t bloom. Do you have that problem with your hydrangea’s? I did a little research, well ok then I did a LOT of research which I am sharing with you today. Hopefully it will save you years of waiting on blooms. Living in the deep south, we are treated to gorgeous floral showcases every spring and summer. Crepe myrtle and hydrangea are among my favorite showy displays. I have both in my yard and have had to learn proper care of them through the years. My hydrangea simply would not bloom and for the life of me I could not understand why. I nursed it through out hot, humid summers every year. Hydrangeas require shade and lots of water, I have provided both along with organic additions to the soil. I was also cutting it back every winter. Notice the photo below, it’s just sticks in the winter time. I was confident those needed to be cut back. WRONG! 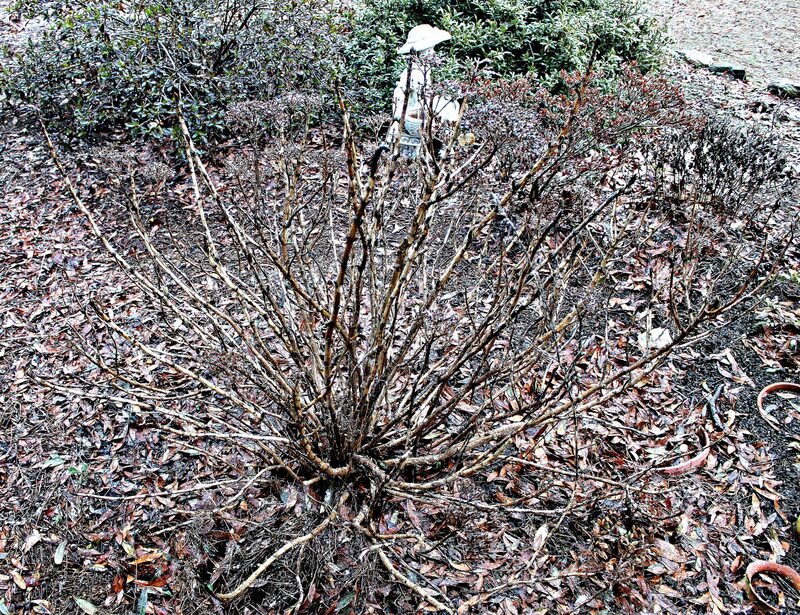 DO NOT CUT BACK YOUR HYDRANGEA! That is the one thing I was doing wrong. While it may seem natural to cut back, don’t do it. Hydrangeas bloom from the old shoots! Why in the world I didn’t research it sooner is beyond me. I had been cutting mine all the way back for a few years so I think it may take it a few years for the old wood to really produce nice big flowers. Pruning is ok when done properly. I read to never prune more than 1/3 of the hydrangea in any given year. Some resources I read actually do say to cut the hydrangea all the way back BUT that advise is only good for a particular type of hydrangea. There are always variables. 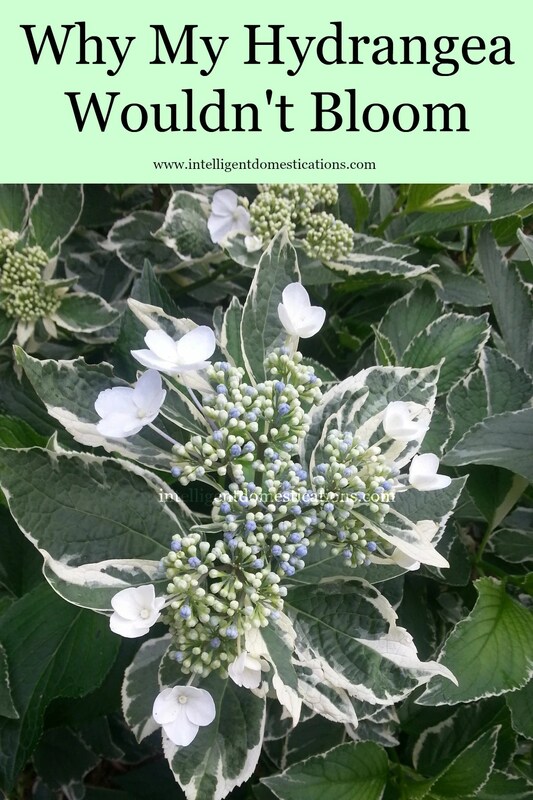 Learn the correct method for your type of hydrangea and your geographical location. I have provided a list of resources at the end of this post. The above photo is very early spring when the first leaves are just beginning to appear. Notice all the oak leaves on the ground for natural compost. Our soil is terrible and that is putting it mildly. We have more sand than good dirt so composting is essential. Raking leaves into my flower beds is one of my favorite things to do. We usually also pile on new pine straw once per year on top of the leaves. Last year was the first time we had a few pretty flowers but still not quite enough to create a bouquet for drying to use in the house. The above photo was taken in late summer when the flower bed had become the ‘Garden of Weeding’. There are always weeds to pull. We like to keep our birdfeeders full so the birds drop seeds which sprout up all sorts of weeds and wild flowers in all the wrong places. 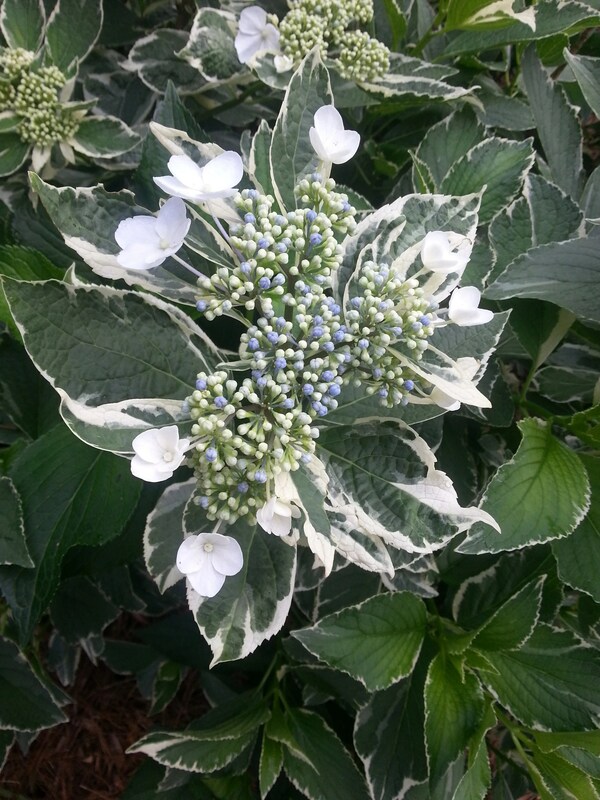 The above photo is one of the flowers on my Variegated Hydrangea. I love the variegated leaves on any plant. It looks like God put streaks in their hair! 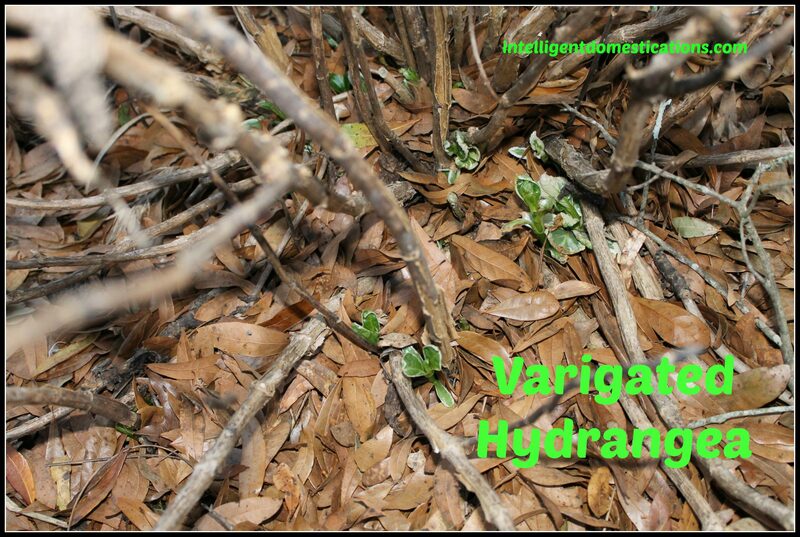 Don’t cut your hydrangea down to the ground! I have also Pinned quite a few hydrangea posts to my Yard & Garden board on Pinterest available below. Follow intelligent domestications’s board Yard & Garden on Pinterest. 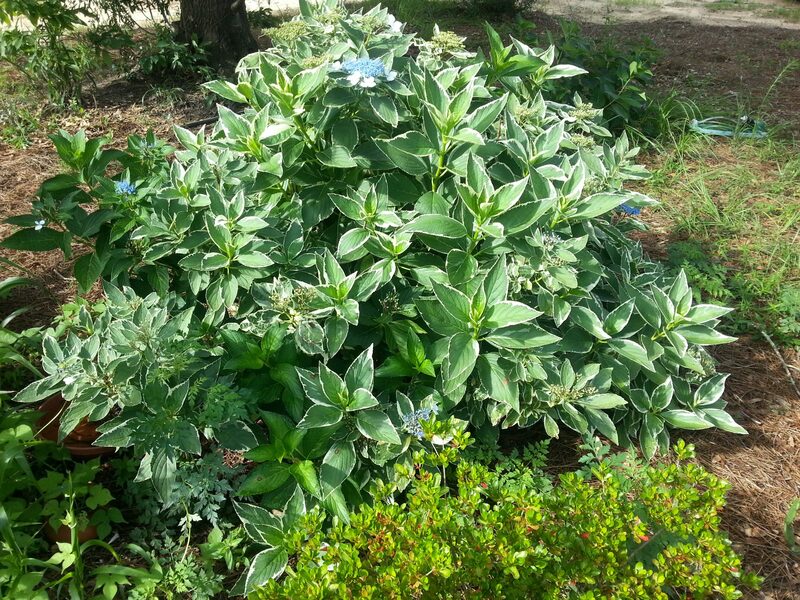 Have you had to learn the hard way to care for the plants in your yard too? Hydrangeas are just gorgeous. My grandmother had one of the “blue” ones, and I’ve always wanted to try to grow one in my yard. Thanks for the tips! I planted a hydrangea in 2008, it bloomed once. I cut it back once and later found out that they were not to be cut back so I didn’t do it anymore. It’s a beautiful plant with leaves galore but has not bloomed since. I do not know why. Any ideas? I have 3 different hydrangea shrubs on the side of my house. After doing some research myself, I’m afraid to do anything to them because I don’t know which variety each of them are. One is passed down from my husband’s grandmother, no pressure there! LOL Anyway, they do bloom so I guess I’m doing something right! I jealous! Hydrangeas are my absolute favorite but don’t do well here. Yours are SO pretty! Thanks for linking up on our Momma Told Me Party! Looks like a pretty flower. If I ever get one, I will be careful not to over cut it!!! I hope you do the research and find that you may have a green thumb after all! If I can grow things, anyone can! I just moved into my house last summer and it has a hydrangea and I had no idea how to take care of it! Thanks for sharing this, now I know what not to do! We have about 5 crepe myrtles in our yard as well. Those need to be pruned back a good bit for better flowering. We waited a few years before we started pruning ours and they didn’t bloom as well as they do now. I have a friend who quit pruning his crepe myrtles to see how tall they would get. I think Ga. Power has to cut his out of the power lines and they bloom beautifully! He has much better dirt than we do. I know those are special from UGA! I like growing flowers much more than growing food. I know I should be ashamed but I’m not. I’d like to root some hydrangea also! That would be awesome.